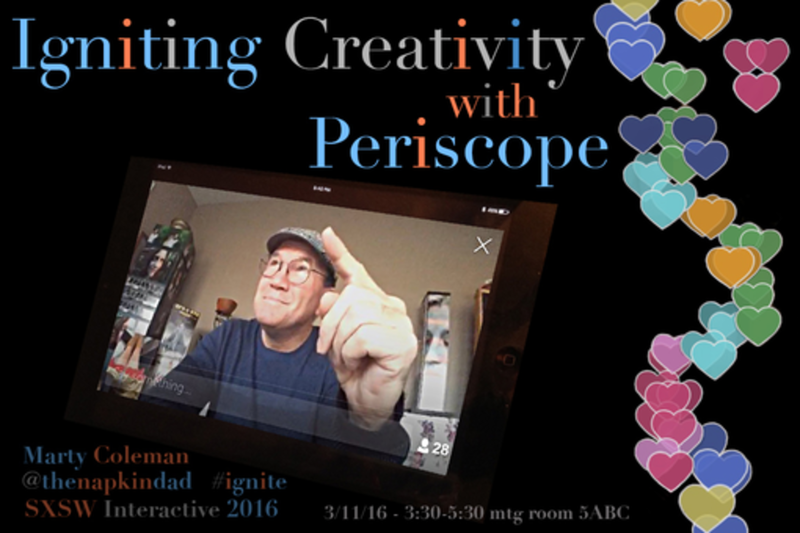 It's not that hard to show creative work on Periscope. But enhancing that experience so the viewer is inspired and motivated to embark on their own creative journey takes a bit more planning. We will start with a 6 point planning guide for effective visual & verbal techniques for compelling & creative Periscopes. Next we will move into hands-on practice, bending those techniques towards the goal of igniting an audience to be on fire in their own creative pursuits! and in so doing creating a loyal, positive and inspired audience. I am the owner of Napkin Dad Press - including the blog 'The Napkin - Absorbent Art for Head and Heart'. I sell prints and original drawings, do commissions in drawing and photography, and give presentations and workshops on a topics ranging from change to procrastination, all with a focus on creativity. I also work with individuals as a creativity coach, helping them overcome creative blocks and reenergize their efforts, even if dormant from a young age. I work part-time as a Program coordinator and running coach with Fleet Feet Tulsa, getting participants ready to run races ranging from 10k to 1/2 marathon distances. My own efforts are focused on 1/2 and full marathons. I am married to Linda and am the proud father of 4 grown daughters and 2 not grown grandchildren.